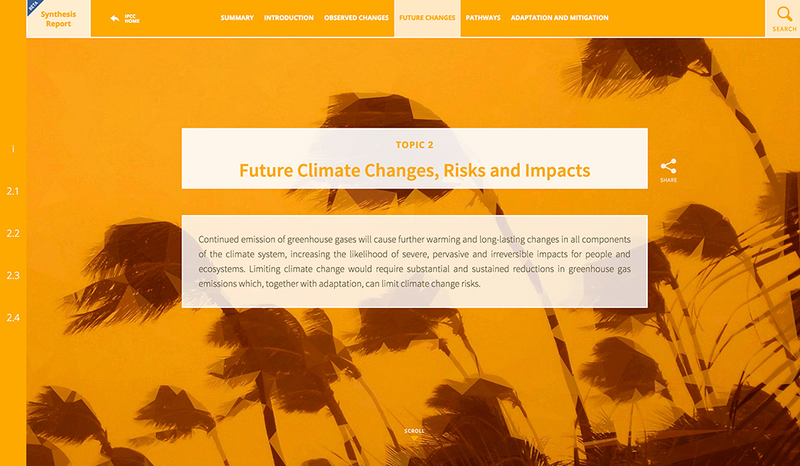 The Intergovernmental Panel on Climate Change is the world’s leading climate science authority. A Nobel prize winning institution, the IPCC produces major climate science reports that comprise of the world’s top scientists. They produce three main volumes of work that include thousands of pages of documents, graphics and data. Part of their major deliverables is a synthesis report which introduces the main findings from the three main underlying Working Group reports. 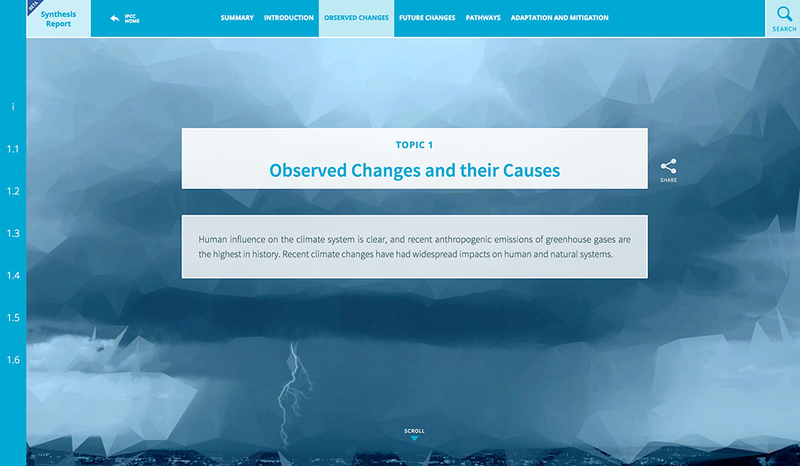 The IPCC wanted a better way to show the underlying information that comprised the synthesis report so that scientists, policy makers, and the media could more easily access and reference information. 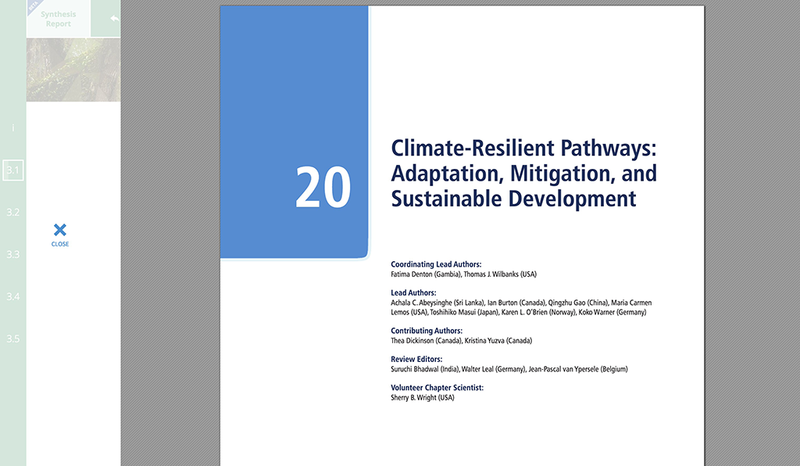 The IPCC’s Synthesis Report (SYR) is a document that synthesizes the findings from the IPCC Fifth Assessment. The report, which is over a hundred pages, contains thousands of links to the underlying Working Group report. 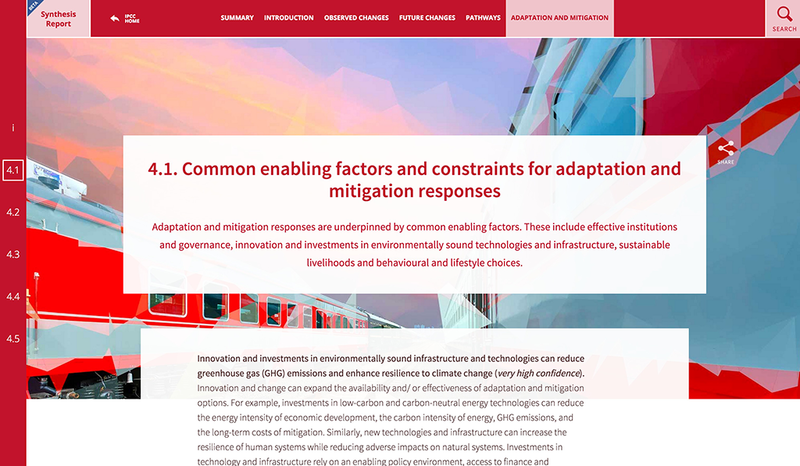 This project represents the IPCC’s first attempt at launching a report that is not only mobile friendly, but provides better access to the underlying documentation that make up the report itself. The site provides an easy to use mechanism for users to read the synthesis report and quickly access the underlying materials. Thousands of references were linked and the user is brought to the exact page of the underlying report. The underlying report can be read and the user can quickly go back to where they were in the synthesis report for further reading.